We are pleased to announce an important security feature as an (optional) extra layer of protection to our Client Area – Two-Factor Authentication. Once enabled & configured, each time you sign in you will be asked to enter both your username & password as well as a six digit security code. You can enable this feature by accessing the Security Settings section in our Client Area. You will be shown a QR code and a secret key which you will need to scan or key in to your mobile device’s authenticator application. You will then go through a verification step where you will need to key in the six digit security code that is generated by your mobile device’s authenticator application. Any mobile authenticator application which supports the Time-based One-Time Password (TOTP) algorithm can be used to generate the security token for you. Many individuals tend to use the same password for all of their login points. In the event that a malicious users gains access to one login of you or your staff, they could potentially gain access to all other login-required sites like your access to our Client Area which can lead them to your website. 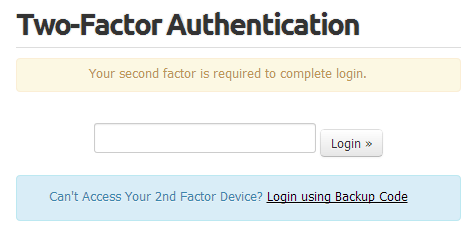 Two-Factor Authentication puts a stop to this by requiring users who successfully login in with a user & password combination to use a physical device you possess for further verification. Please do let us know if you have any questions or concerns about this.